Bordering no longer happens only at the borderline separating two sovereign states, but rather through a wide range of practices and decisions that occur in multiple locations within and beyond the state’s territory. Nevertheless, it is too simplistic to suggest that borders are everywhere, since this view fails to acknowledge that particular sites are significant nodes where border work is done. Similarly, border work is more likely to be done by particular people than others. 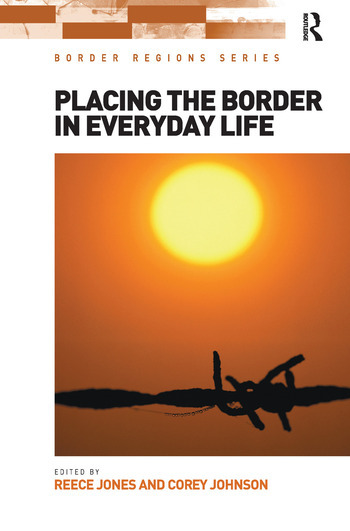 This book investigates the diffusion of bordering narratives and practices by asking ’who borders and how?’ Placing the Border in Everyday Life complicates the connection between borders and sovereign states by identifying the individuals and organizations that engage in border work at a range of scales and places. This edited volume includes contributions from major international scholars in the field of border studies and allied disciplines who analyze where and why border work is done. By combining a new theorization of border work beyond the state with rich empirical case studies, this book makes a ground-breaking contribution to the study of borders and the state in the era of globalization. Reece Jones is Associate Professor in the Department of Geography at the University of Hawai’i at MÄ�noa, USA. Corey Johnson is Associate Professor in the Department of Geography at the University of North Carolina at Greensboro, USA.